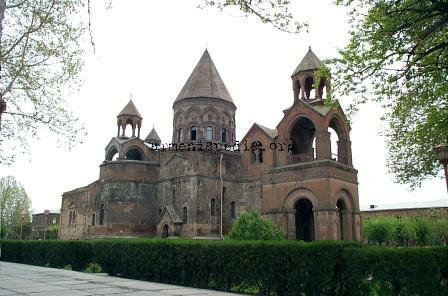 The Town of Ejmiatsin, now officially known as Vagharshapat is primarily known as the site of the Ejmiatsin Cathedral Compound, which is the headquarter of the Armenian Church. In addition to the compound, there are the churches of Hripsime, Gayane and Shoghakat. The town is also known for it's kyufta, a traditional Eastern Armenian dish, and even has a "Kyufta Street", with a number of kyufta specialists. This page was last edited on 14 October 2010, at 17:05.